Who likes to make their slow cooker do all the work? ME! St. Patrick’s Day is this Sunday and what better way to celebrate the holiday than by dusting off your trusty KitchenAid slow cooker and letting it cook dinner for you! 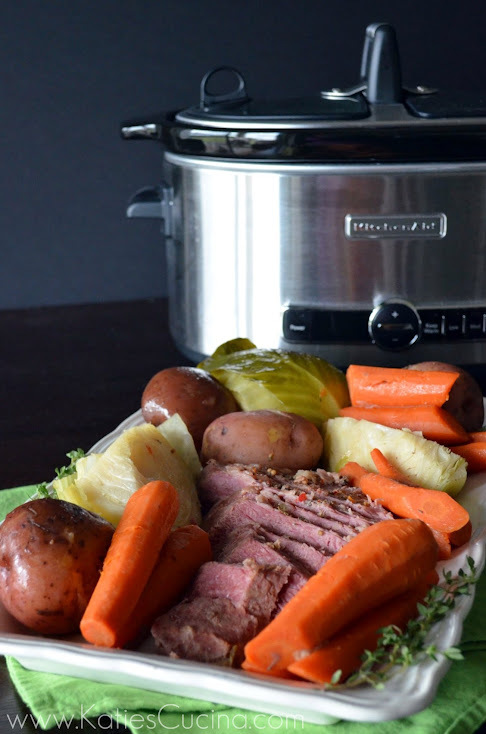 Slow Cooker Corned Beef and Cabbage, to be exact! Seriously. I’m not kidding. This is a 100% slow cooker meal. A one-pot wonder in my book. Simmering for hours on low allowing for the Corned Beef to get nice and tender. Everything goes in the slow cooker in the morning sans the cabbage which is added to the slow cooker during the last hour of cooking. I love to use big thick carrots when making any type of roast and this one is no exception. Believe it or not these veggies will not turn to mush after slowing cooking them all day with the meat. They are fork tender and full of flavor. I also like to get my Corned Beef drunk… I submerge it in 3-1/2 cups of dark beer. 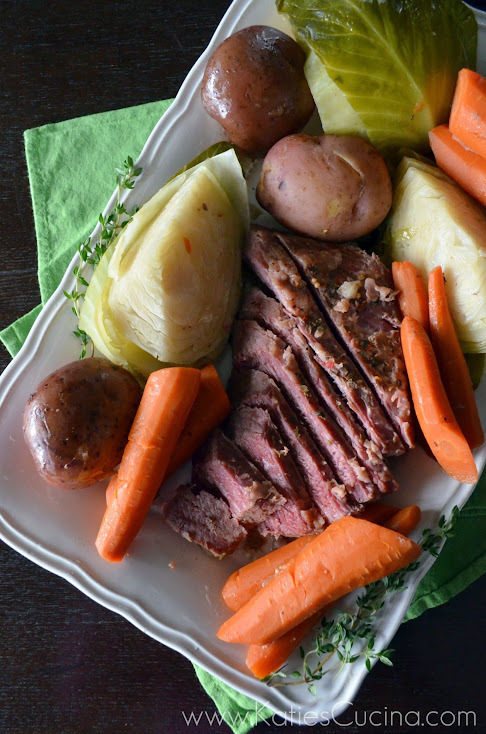 It just so happened that when I made this Slow Cooker Corned Beef and Cabbage that my husband had a dark ale that he had recently home brewed. So that is what I used. It is really convenient to have a beer on tap at your disposal! If you don’t like dark beer don’t fret. I’ve used lagers before and they work wonderfully. Don’t like beer? Just add water then, but trust me you can’t taste the beer–the alcohol cooks off in the meal. Like what you are reading? Subscribe to my Monthly Newsletter! Love the idea of beer in here. I usually slow dry roast my corned beef (wrapped in foil) so don’t add liquid. This is definitely worth a try though! Oh I’m intrigued… slow dry roast? I’ve never tried this way. I’ve only done stove-top or slow cooker. Do tell my friend! I have yet to make corned beef myself. It always kind of intimidated me, but using the slow cooker is a great idea! Steph–seriously it is one of the easiest meals to make!!! I cooked my corned beef and cabbage in the slow cookier (minus the beer) last year. It was really good. My husband and I did this more than a few years ago and our precious corned beef/potatoes/cabbage turned out mushy. I think that was before we knew you weren’t supposed to take the lid off until it’s done. 🙂 I totally want to try again with your addition of beer! Rachael, Yes–not taking the lid off is key as well as “low and slow”. Give it a try again–I don’t think you’ll be disappointed.